But in recent years, some safety advocates have raised health concerns about potential side effects of recycled crumb rubber turf. The Institute of Scrap Recycling Industries has countered by pointing to 75 studies which confirm the safety of crumb rubber within U.S. standard exposure limits, and American and European organizations are meeting in December 2015 to discuss standardizing global recycled rubber specifications. This controversy will undoubtedly continue, but meanwhile, recycled rubber continues to display an impressive range of practical applications, making it one of the unsung heroes in the green revolution. Since 1991, British Columbia’s provincial scrap tire recycling program has recycled 50 million tires, the Alberni Valley Times reports. Since 2007, the former government program has been managed by nonprofit Tire Stewardship BC, which recently converted an unsafe Cadboro-Gyro Park wood playground into a new playground surfaced with recycled rubber from tires. The rubber surfacing was installed according to the latest safety standards, and serves as a cushion to protect children from falls off playground equipment. Playground surfaces represent just one of the applications BC’s program has found for rubber. Eighty to 90 percent of the tires collected each year get recycled for uses such as rubberized asphalt, turf fields, athletic tracks, recreational flooring, landscaping, and agricultural and industrial mats. Recycled rubber even makes good material for railroad ties. In Pakistan, rubber from recycled tires goes to make donkey wheels, shoe soles, sandals, and slippers, among many other applications, according to Practical Action, a British organization dedicated to using technology to fight poverty. The chemical-resilient and puncture-resistant properties of other buna rubbers, such as nitrile, protect human hands by serving as gloves. Recycled rubber is even making a fashion statement in the form of purses made from tire materials and bags made from fire hoses. Much like recycled shoes, recycled tire rubber can be used to create athletic tracks, playground surfaces, and synthetic turf. The tires and rubber are ground into small pebbles with the steel belting and nylon removed during the process. It can be laid on at different densities and using different methods to produce a hard running track, or an energy absorbing soft playground surface. 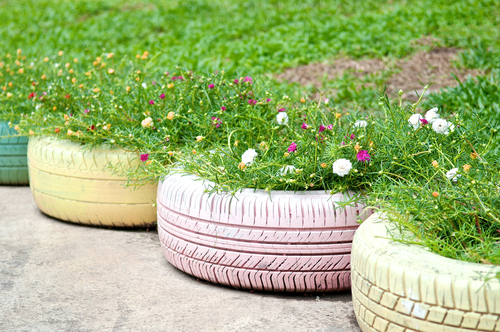 Recycled rubber’s green benefits extend to those with green thumbs. Last month’s British garden retail trade show, Glee, showcased a range of planters made from recycled tires. The rubber flower pot trend has caught on in Australia as well, with Inhabitant writer Diane Pham reporting on how one gardening guru was so enthralled with tire-based flower pots she saw in Pakistan that she brought them back to Southern Tasmania and began making them herself. With such growing demand, manufacturers are designing recycled rubber planters to satisfy both consumer aesthetic demands and environmental concerns, demonstrating once again that eco-friendliness can also be stylish. Commercial spacecraft company Virgin Galactic returned to using rubber-based fuels for its SpaceShipTwo craft this month, illustrating one of the most exciting uses of recycled rubber. After extensive research into various fuel alternatives, Virgin Galactic settled on a material called hydroxy-terminated polybutadiene (HTPB) found in rubber tires as the optimal fuel for its ships, serving in combination with nitrous oxide as oxidizer. This type of fuel possesses both environmental and safety advantages over traditional rocket fuels, being non-pollutant as well as unlikely to explode. Aviation innovators hope that rubber-based fuel will soon help make safe, eco-friendly commercial space flight possible. It hasn’t been all roses in the tire recycling business though. 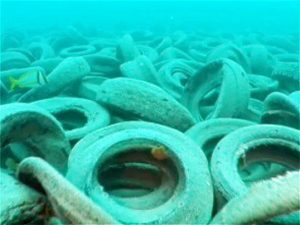 An well intended effort in the early 1970’s was to create a huge artificial reef of tires off the coast of Fort Lauderdale, Florida ended in an environmental disaster with the tires breaking loose and scouring the bottom. A patch on the ocean floor about the size of 31 football fields was pummeled by the barrage of tires, and thousands more tires have blocked coral growth on nearby reefs. Hurricanes have only added to the spread and destruction of marine life by these tires. In 2007, an effort to clean up tires from the plagued Osborne Reef was undertaken by the US Military as a training exercise. With only 10 percent of the tires removed by 2010, and military commitments in the Middle East, it is not likely to be finished soon. Recycling different materials is a hot topic nowadays and new solutions and ideas are welcome. Tires are really very widely used and many of them end up on the landfills or the bottom of lakes and seas. I am happy that there are people thinking of ways to reuse and recycle the enormous amount of rubber waste that comes with old tires. Thanks for the post!